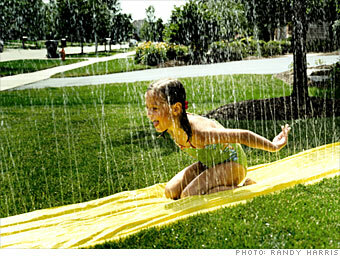 Front yards in Naperville are big enough for a mean game of Slip n Slide. It's no wonder Naperville has made Money's Best Places list three times now. The walkable downtown area is packed with restaurants and shops. The popular Riverwalk is a nearly two-mile brick path that follows the DuPage River's course through town. Naperville's proximity to Chicago is a plus, but there are plenty of jobs to be had right here. Edward Hospital and Nicor Gas employ more than 8,000 people between them, and companies such as BP America, Lucent and Tellabs have offices in town. Graduates of the city's schools handily outscore state and national averages on college entrance exams. And Naperville's public library is ranked the best in the nation among small cities by Hennen's American Public Library Ratings. On the downside, housing is pricier here than in some nearby suburbs; the typical three-bedroom, two-bath house runs $380,000. And congestion on the city's major roads can slow traffic to a crawl. There are no Best Companies to Work For in this state.